Ozgen Design Studio was commissioned in August 2010 to design a wayfinding and signage system for SALT, a new cultural institution in Istanbul. client: Garanti Kültür A.S., Istanbul, Turkey. SALT’s activities are distributed between two landmark buildings. The first building, SALT Beyoglu, is on the pedestrian street Istiklal Caddesi. SALT Beyoglu’s interiors are mostly occupied by exhibition and event spaces. The second building, SALT Galata, is the former 19th century Imperial Ottoman Bank headquarters designed by Alexandre Vallaury. SALT Galata houses a specialized public library and archive; spaces dedicated to research, workshops, exhibitions and a conference hall; as well as the Ottoman Bank Museum. The signage elements were developed taking the cultural and visual legacy of Istiklal Caddesi (Pera) as inspiration for circulation and display of programmatic information throughout the building. 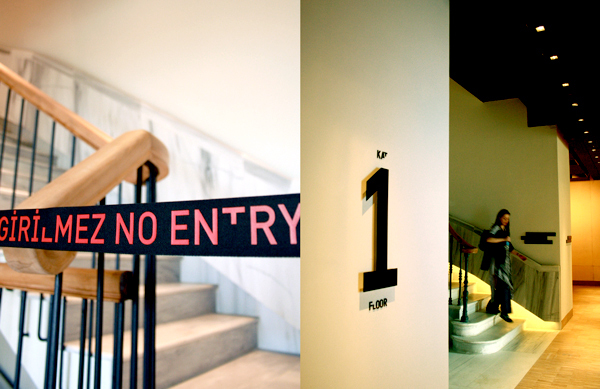 the institution and the street is the Forum, SALT Beyoglu’s entry space. The typeface, Kraliçe, which was created by type designer Timo Gaessner for Project Projects which was commissioned for the visual identity design if SALT.